The Power of Praying to the LORD. Genesis 25:21 (NIV) Isaac prayed to the LORD on behalf of his wife, because she was barren. The LORD answered his prayer, and his wife Rebekah became pregnant. Good morning my friends, I’m back again. Praise the LORD! It’s so good when we have the POWER of Heaven. God’s NOT DEAD: He’s Alive! He’s waiting to answer your prayers. However, we need to know how to unleash the POWER of HEAVEN into our lives afresh today. Prayer played an important part in a crisis in Isaac’s life. Today we’re going to see how he solved that crisis by going to the Lord in prayer. If you’ve got a PROBLEM today: Even if you’ve had it a long time, take it to the ONE who can break EVERY CHAIN. Isaac’s wife had a serious problem: She was barren. When a woman was barren in those days, people thought they’d been cursed or were under God’s judgement. It was a shameful thing not to be able to conceive. Isaac, unlike many husbands in those days, did not criticise Rebekah or reject her because she was barren. He loved Rebecca so instead he prayed to the LORD for her. I think we can all learn a lesson from this verse today: If couples prayed to the LORD for each other when things are not going well, instead of criticising each other or blaming one another, then we unleash the power of Heaven into our family life. You’ll be surprised how your own attitude will change when you pray instead of moan. So my friends, let’s make prayer a big part of our home and family life. You’ll discover The Lord can improve every area of your home and the family atmosphere can change. When was the last time you spent time with Jesus praying for your wife or husband? The Film: The War Room: The Prayer Closet: Loved that film. Let’s get to praying regularly for our closest family members. 2) What Prompted Isaac to Pray? It was a problem that prompted Isaac to pray. That is not what most people do with their problems. Generally when problems come, people fuss and fume, some swear and shout, and many resort to drugs or drink when serious problems come. Fussing, Fuming, Swearing, Shouting or Drugs and Drink: But we all know that PROBLEMS cannot be solved like that, these things only tend to make the problem seem like an insurmountable MOUNTAIN. When we act like that, we begin to even feel bad about ourselves. We had friends who’ve taken their own lives because of what seemed to us like a trivial problem. But they FOCUSED on the STORM instead of the ONE who calmed the raging waves with just a word. The best way to confront all your problems is to pray about them. Prayer is a problem solver. No matter how big your problem, you can take it to the Lord in prayer. When you do you’ll get REVELATION: Problems will begin to seem so small when we take them to Jesus. Prayer to the LORD will indeed change things. He can work great wonders, awesome miracles. When you come to the LORD with your issues in life, the problem doesn’t look quite so big as our Lord. The POWER of PRAYER is the LORD to Whom WE PRAY. Rebekah had been barren for twenty years; but after Isaac prayed, she conceived and not only bore one child, but she had twins! That’s AWESOME: TWINS. My friends, do not underestimate the power of prayer to the LORD. Many people dismiss or scoff at prayer, but wise men, wise women, wise children and youngsters know that prayer to the LORD can work wonders. You know that song, “There is POWER in the Name of Jesus” … there’s a repeated refrain, “BREAK EVERY CHAIN”… No matter how LONG you’ve had your PROBLEM… God can BREAK it’s POWERFUL CHAINS…. 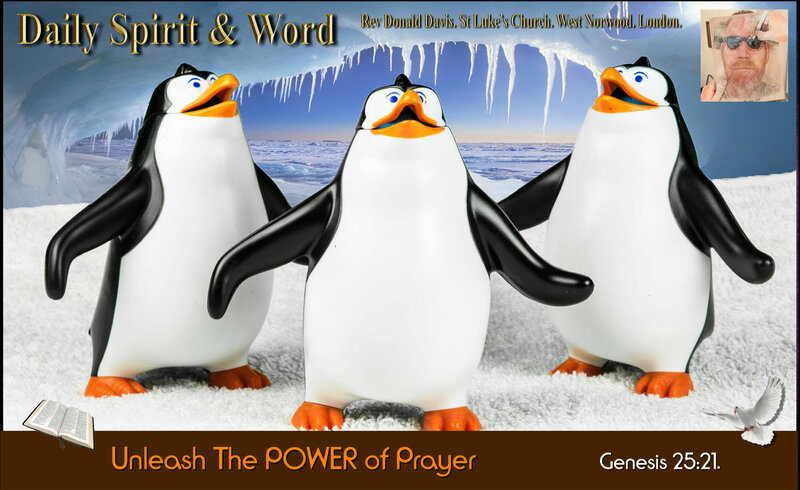 Take it to the LORD in prayer and unleash the POWER of Heaven. Have an AWESOME Sunday with Jesus.